I've spent many years as a professional ghillie observing the rivers and the political 'quagmire' before forming an accurate assessment of the state of affairs within Scottish salmon fishing. Here's a few of my innermost thoughts on where the real problems lie and what our rivers now require if massive 'untapped' social economic benefits are to be realised. You've got to ask yourself why on earth this systematic global poisoning scheme has been allowed to continue & develop for 40 years given the fact that there's plenty of highly credible ecological evidence to prove they have polluted the Scottish West coast sea lochs in addition to destroying the West's once prolific runs of wild salmon and sea trout. For those of you who were fortunate (or unfortunate!) to experience fishing the west coast in the 70's (or before) you'll remember its sheer brilliance! I've personally seen salmon river pools on the West coast where you couldn't see the riverbed but only the slow waggling backs of hundreds of salmon where one cast of the fly was all that was ever needed! What is also clear is that at best the Scottish salmon fishing asset has been 'micro managed' and not 'visionary' managed to date which is a bi-product of a lack of funding being made available to protect & develop the resource and for significant wild Atlantic salmon stock investment initiatives. I also know our wild salmon are valuable and that has certainly been their downfall so if anyone thinks they are not being 'intentionally' targeted (not bi-catch) between their feeding grounds and the Scottish river estuaries then they're behaving like an ostrich! Human nature 'is what it is' so huge oceanic congregations of 'unguarded' £100 notes are not going to be magically ignored! I did however see an article recently which I hope is accurate showcasing some new high tech Royal Navy Fishery Patrol vessels that have been ordered which will do no harm since the original fleet was stood down! If recreating huge runs of wild Atlantic salmon is the objective then there's no point continuing to poke the management of this God given asset with a stick so better the management properly engage their brains and get their shirt sleeves rolled up. What Scotland needs right now is a centralised super Atlantic salmon wild smolt producing 'mega' hatchery and wild smolt ranching facility sited somewhere accessible from the A9 between the Tay & Spey headwaters where all Scottish river staff can bring their eggs for hatching and rearing on. Let the experts do the calculations for the square footage required for its roofed section where pre fertilised eggs can be laid out on trays from individual Scottish rivers & tributaries before being taken outside to moving water ponds where the fry can safely and naturally be brought on to 'super fit' & 'ocean ready' smolts before returning them to their native rivers for release. Yes this will likely require a £10 to £20 million pound investment but that would be small potatoes to fully re-charge the Scottish salmon river stocks 'naturally' and would no doubt play a huge part in taking Scotland's salmon fishing economic revenue from the current £150 million up to a £1 billion within a 5 to 10 year period if the work started now. Siting this project on or near the A9 could potentially make the initiative a 'self funder' going forward if merchandising, classroom & restaurant facilities were incorporated into the plans given the massive volume of passing tourists, general public and the global fascination of the Atlantic salmon and its plight. The above individual hatchery trays and individual ranching ponds would keep the 'genetic integrity' of these salmon intact to keep the scientists happy but the reality of that industry 'buzz word' is that it's nonsense as successful evolution requires the cross splicing of genes and always has done. If 'genetic integrity' was that high on the agenda why on earth were farmed salmon ever allowed into sea cages that have always been vulnerable to an escapee scenario! Look at our own species and ask yourself the question is there such a thing as a true Scot or Brit these days. Your family tree if studied would most probably tell you that your ancestors came from different areas of Europe or the world and it'll be no different for a salmon that is free to travel anywhere it wants without a passport or complex visa requirements! Imagine a Scottish salmon fishing scenario where fishery management are pleading with Government officials to grant more commercial netting licenses to 'thin out' the over abundance of wild Atlantic salmon runs. Where the ghillies are keeping their own pet gooseanders to keep the huge shoals of fry in their beat fit and healthy! Where anglers are continually complaining to hotel management about their inability to get a parking place in the hotel car park or where Avis & Hertz have completely run out of hire cars at our international airports! 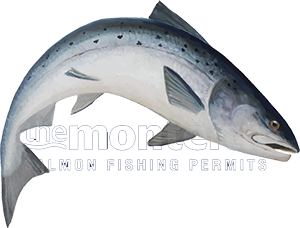 Imagine a scenario where anglers who were all once used to catching & releasing salmon complaining bitterly that the Government & fishery board rules are now mandatory 'catch & kill' policy by law! Start releasing 10 million wild smolts into the Tay each year (as an example) and you don't need to be that clever with a pocket calculator to work out the inevitable!